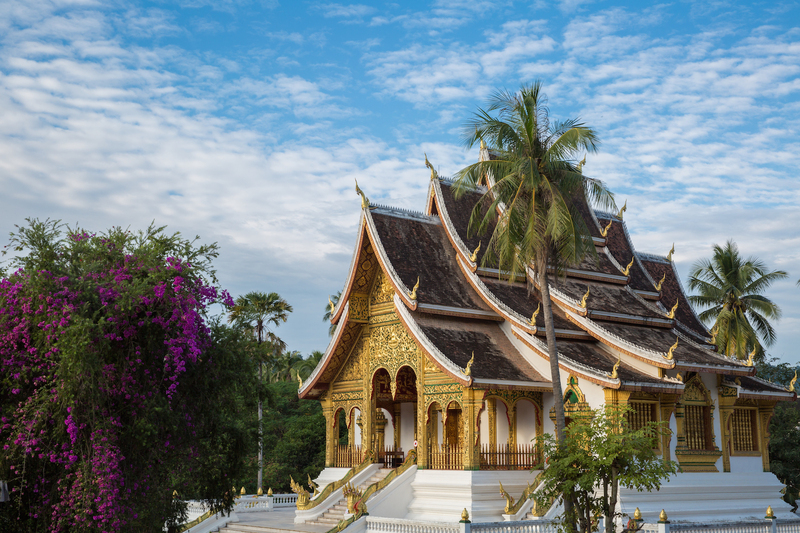 On the heels of the twenty year anniversary of its UNESCO World Heritage Site designation, the peninsula city of Luang Prabang remains one of the most spectacular experiences to be had in Laos. Our editor, Erika Lenkert, with junior editor Viva, explores the Southeast Asian city in the country’s mountainous northern region and discovers a relaxed, walkable destination replete with stunning, historic Buddhist temples, fusion Laotian and colonial architecture, colorful outdoor markets, and enough traveler-savvy hotels and restaurants to make the gluten-free adventurer feel right at home. If ever there was a reason to leave your hotel room at 5:30 a.m., this 6:00 a.m. alms-giving ceremony along Sisavangvong Road is it. 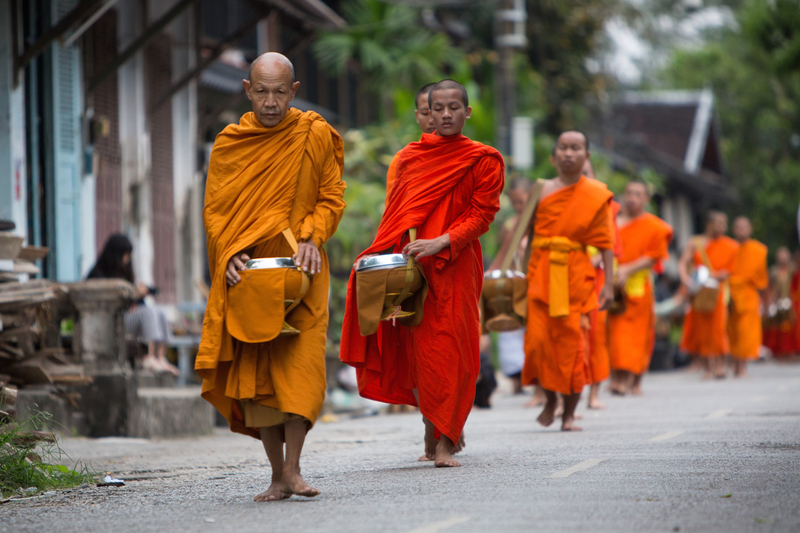 Despite the throngs of photo-snapping tourists, there’s no denying the beauty of witnessing the town’s monk population, clad in vibrant orange robes, walking the streets collecting food offerings. If you want to participate, ask your hotel staff for guidance. 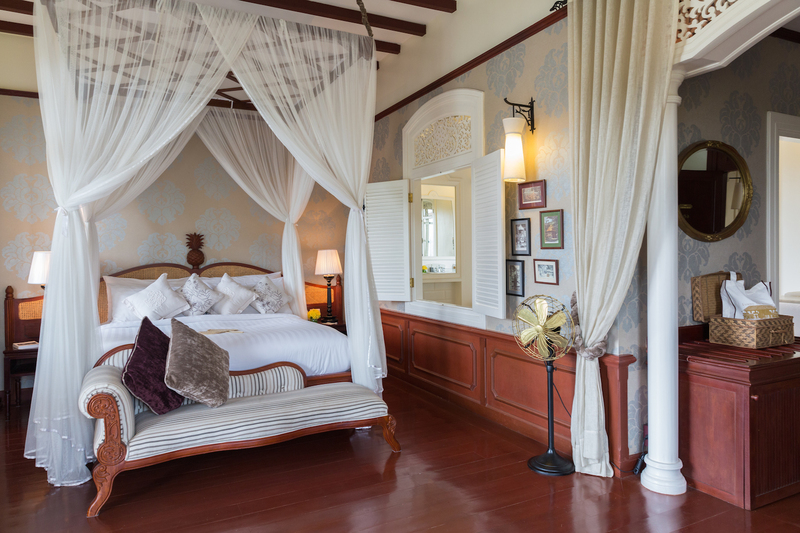 There’s much to love about the traditional Laotian massage at Peninsula, the extremely basic spa close to Xieng Thong temple on the Mekong River, where walk-ins are welcome, expert attention is paid to the body’s pressure points, and prices hover around $6 per hour. It’s as touristy as it gets, but Kuang Si Falls (aka Kuang Xi or Tat Kuang Si Waterfalls) is Facebook-cover worthy. About a half-hour drive outside of town, the three-tiered travertine falls with various swimming opportunities are a wonder to behold—and a blessing during the hot, humid afternoons. Expect to pay around $2.50 for admission and bring your own towel. Some of the country’s most stunning temples are here and can be visited year-round. Bring cash to get in, dress modestly (women need a cover-up to conceal bare shoulders), and be prepared to marvel at the astounding murals and mosaics adorning the town’s thirty-plus Buddhist houses of worship. You can walk pretty much everywhere here, but bike riding is a convenient and charming way to get from point A to point B, especially if you want to beat the often oppressive heat. If your hotel doesn’t lend bikes, you can find rentals widely offered on Sisavangvong Road, the city’s main street. There aren’t that many shops selling trinkets worth jamming into your suitcase, but you’ll find gorgeous fashions and accessories at Anakha (anakhalifestyle.com) and collectable textiles, artifacts, and photographs at expat-owned Gallery Asiama (asiama.fr). The top of this small, famed mountain, with a pronunciation that inspires chuckles (the h is silent) and 360-degree vistas that cease them, is accessed via a heart-racing climb up more than 300 steps. Fortunately, there are various shaded, historic Buddhist temples and stopping points along the way. Expect to pay a few dollars to join the crowds at sunset; an early morning trek provides a more intimate, majestic experience. Built in 1904 in a mix of traditional and French beaux-arts styles, the ornate prior home of King Sisavang Vong and later Crown Prince Savang Vatthana is the place to browse exquisite artifacts, antiques, and gifts to the royals from other countries. No need for a formal cruise. Buy a bottle of wine from Chez Matt wine shop (on the city’s main street), get them to open it for you, grab some glasses, and head to the Mekong River an hour before sunset. If you negotiate, it’ll cost you only about $20 to charter a boat for a couple of hours and snap photos as the sun dips behind the surrounding mountains. If you’ve been to a night market before, you know the drill: walk the mazes of stalls hawking everything from jewelry to clothing to exotic insects preserved in booze and bargain with the vendors until you reach an agreed upon price. Or just meander the stretch of Sisavangvong Road for the fun of mingling with the crowds and browsing the handicrafts. Traditional Laotian food features a rice-based diet (and often includes MSG). But soy sauce and oyster sauce are common ingredients, making some dishes unsafe for GF diners. Meanwhile, almost no one knows what gluten is, and often waitstaff will nod in agreement out of politeness when they don’t understand what you’re asking. To play it safe, order items that are intrinsically GF: summer rolls; larb (aka laap, the country’s most famous dish, which features ground meat with fish sauce and herbs); and sticky rice with mango and coconut. Avoid street food and drink, and stick to restaurants with English-speaking staff, such as those listed in this article. Though in one of the world’s poorer countries, accommodations aren’t all that cheap in a town where nearly all revenue is generated by abundant tourist trade. 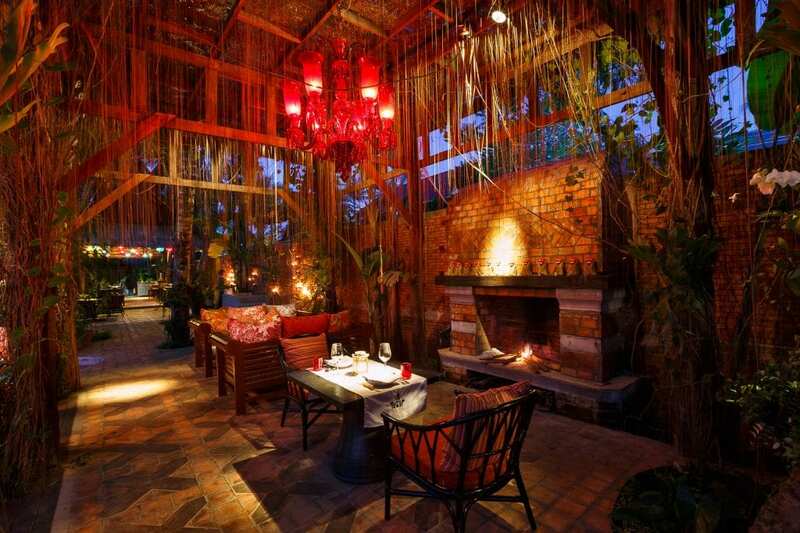 However, an evening stay usually includes breakfast, which offsets some of the cost. GET MORE GFF: Want to see all the pretty photos in this article and get the nearly 50 extra-relish recipes in the issue of GFF where this appeared? Get a print or digital issue of our Winter 2016 issue here!